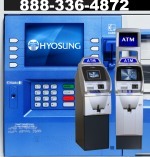 NCR has manufactured automated teller machines for many years now. We no longer sell ATM units manufactured by NCR however. If your ATM needs require an ATM made by NCR, call us for availability and price quote of an equivalent ATM if one is available.